Maciej was born and raised in Warsaw, Poland and is a graduate from the Law Faculty in National Security Studies at the University of Warsaw. He began his career in the Polish Ministry of Defense, Department of International Security, and played an active role facilitating Poland's accession into NATO. Later, he worked as an expert in the Sejm (Polish House of Representatives) serving both the National Defense and European Law committees, and managed international cooperation activities at the Supreme Administrative Court. Maciej briefly worked as a Research Assistant in the NATO Parliamentary Assembly, Brussels. 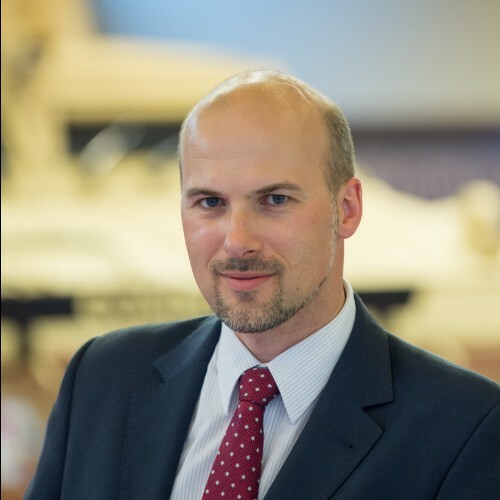 After a career in the public sector, he joined Belgian turret systems manufacturer CMI Defence to run its Polish subsidiary. During his career Maciej was involved in the early development of MSPO, took part in Poland's accession processes to NATO and the EU, assisted numerous legislative procedures in Parliament, and managed top-level multinational conferences and EU-funded projects. He identified industrial partners, successfully negotiated cooperation agreements, and developed brand recognition on the market. He has also authored numerous articles on law and security and has been a guest lecturer in international conferences. Additionally, Maciej has enjoyed guiding Israeli tours in Poland, writing columns for local magazines, and lecturing in postgraduate studies. Happy and proud husband and father, owner of a loudest dog in a neighborhood.